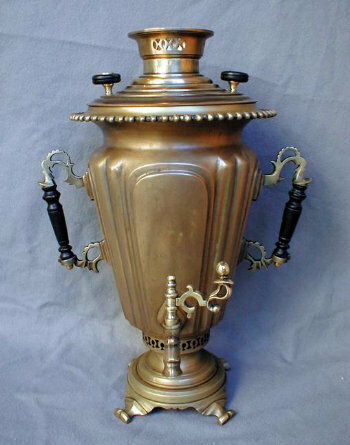 Conical shaped Samovar on grand scale with double panels and flutes sits atop a skirted circular base with paw feet. Traces of original nickel results in a soft mellow patina. Vertical folkloric handles. Pearled upper rim. Multiple Presentation Medallions and Design Awards in 1895. 1896.